Settle CE Primary School is proud to be one of the six finalists for the 2017-2018 Rolls-Royce Science Prize. The Rolls-Royce Science Prize is a two-year rolling competition. In the first year up to sixty primary or secondary schools are awarded a £1,000 Special Merit Award, with which to progress and complete their entry into the Science Prize. These Special Merit Award-winning entries form a shortlist, from which six finalists are then selected. Finalists receive a video camera to capture the development of their project and further £5,000 to finance resources for it. Settle CE Primary school’s project, Foundation and Robot, has three strands we intend to weave together to inspire greater creativity, enthusiasm and confidence in all STEM subjects, especially Science and Engineering. The introduction of IKE, a baby robot who has come to our school to learn alongside our children. Knex Builder’s club where children can develop their creative building skills without curriculum constraints. The Robot Rumble competition to be held at the end of the project. The competition will feature competitive, programming and design elements, and will be open to other primary schools in our area. Simple robots will be making their way into many classrooms to introduce the children to ways that emerging technology can be useful and controlled. 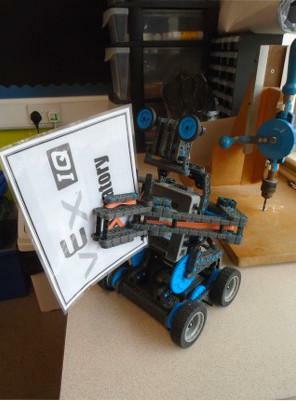 One of our robots, IKE, will be learning alongside some of the younger children by ‘asking’ the children for help in his understanding of humans and their world. Older pupils will get their chance to program robots to carry out simple tasks.